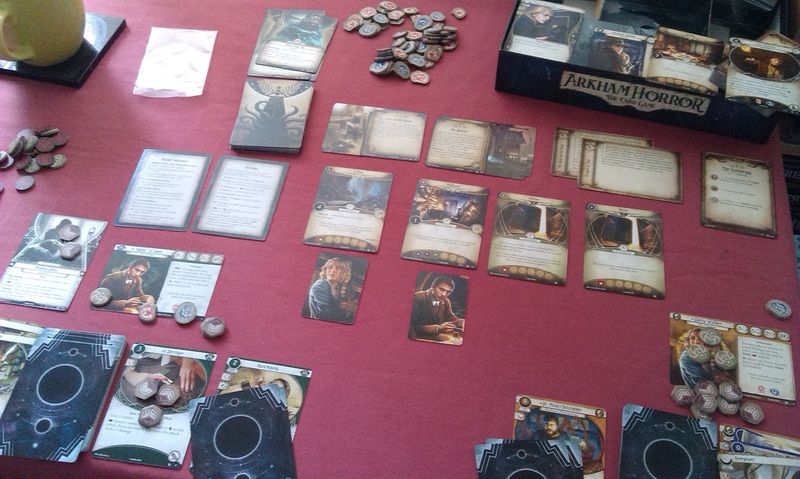 It’s time for another game day blog here at spalanz.com, and today I wanted to talk a bit about the Arkham Horror LCG, which I’ve started to play again as part of a campaign rather than just the one-off games I had back at Christmas while I was learning the ropes. I know I’m a bit late to the party on this one, as the game has been incredibly popular for months already, but I thought I’d just ramble a bit about it all, and then talk about the first game in the Night of the Zealot campaign that I had a couple of weeks ago! Before I go any further, I think it’s probably useful to have read my earlier blog where I talk a lot about my reactions to the game after playing through each of the core set scenarios. Back then, I was playing as Roland Banks with the starter deck suggested in the rulebook, and I didn’t feel any need to deck-build throughout the attempts. I was gaining experience, as I was trying out the campaign back then also, but the deck-building options just didn’t really do anything for me. This time around, I’m playing different decks, headed up by Skids O’Toole and Daisy Walker. The Ex-Con and the Librarian; it’s got rom-com written all over it! Again, I’ve just mashed the ten level-0 cards from each of their possible character classes, along with ten level-0 neutral cards, to form the decks to start with. However, right from the off, I’m seeing how it can be exceptionally useful to actually deck-build here, and I’m now considering buying a second core set in order to widen my options. 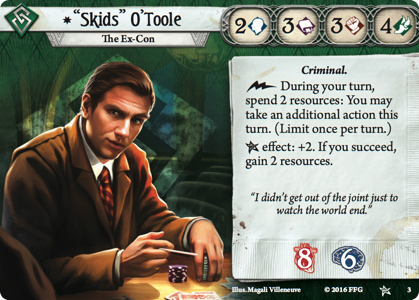 The decks that are possible with the core set cards just feel very narrow, I think because we only get one copy of each class card and, to build a 30-card deck for the investigator, we need therefore to include all of those class cards. With two core sets, you could use two copies (the maximum allowed) of five cards, and refine your deck accordingly. I’m sure you don’t need me to lecture you on the art of deck-building, of course, but I think it’s worth pointing out anyway. While I’m writing this blog, I still haven’t pulled the trigger on a second core set, mainly because I’m in the middle of buying a house, but I do foresee getting it before the end of the summer, for sure. Something that I talked about at some length in my earlier blog was the idea that I didn’t want to play the core set scenarios again after the first run-through, due to the fact I knew what was happening in the story there. While this is true, and is probably the biggest factor in my not picking the game up again for the last six months, I found the game to still hold a lot of my attention despite this factor this time around. One thing that was immediately apparent was the added benefits and disadvantages of playing with more than one investigator. For a start, the number of clues spawned at locations was doubled, meaning the game was potentially sped up that much more. 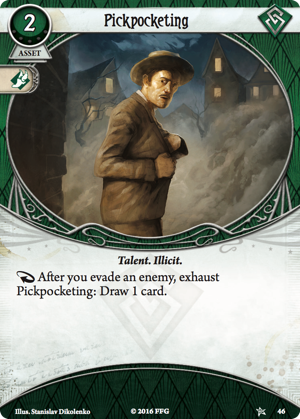 However, the number of encounter cards drawn was also doubled, but as these cards were – either by accident or design – predominantly affecting the investigator who drew them, it didn’t really impact on the game overall. For example, Skids drew a card that forced him to make a skill test, then Daisy drew a card that affected the location only she was at. 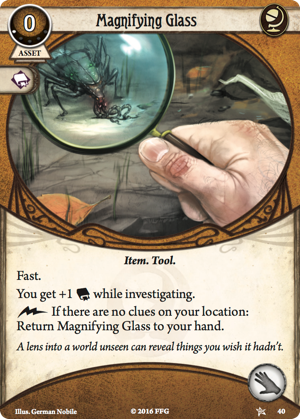 Comparisons with Lord of the Rings LCG have been made all over the place, naturally, and I don’t think they’re particularly wrong, but the way the encounter deck is built with predominantly treachery effects rather than enemies means that adding more investigators usually isn’t as much a hindrance to the game as it is for the older LCG. 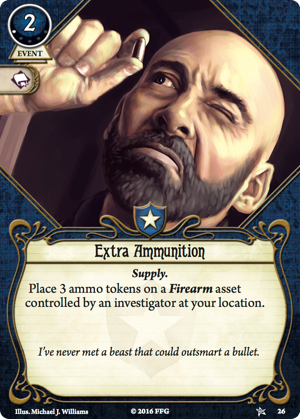 Of course, oftentimes you do need to spend clues equal to the number of investigators to advance the act deck, leading to a nice sense of balance in the game overall. I’m surprised at how little overall impact knowing how the story ends actually had on my enjoyment of the game this time around, however. I still managed to defeat the Ghoul Priest (mainly thanks to some very lucky cards from Skids, I have to say!) and I still opted to burn my house down – but knowing this would be coming didn’t stop me from having a good time! So that was very pleasing! So I’ve completed the first scenario, and both investigators managed to score six Victory points by the end of the game. Skids O’Toole has gained the company of the lovely zealot Lita Chandler, and I’ve used two of his experience points to upgrade the deck. One point went on upgrading the Leo De Luca ally, and with the second I swapped out Pickpocketing for some Extra Ammunition. 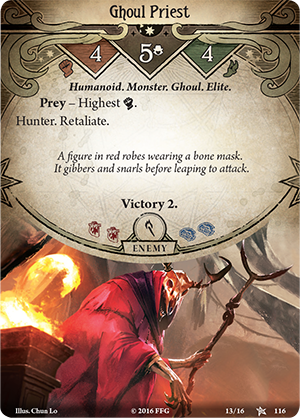 With only two target cards for this in the deck, I think that’ll be one of the first things I do when I upgrade to a second core set! Daisy didn’t seem to have as many interesting options, however. I’ve upgraded her Magnifying Glass, but that’s it. I was hoping I could get a few more Tome assets, but again, with only one core set, the pickings are slim. 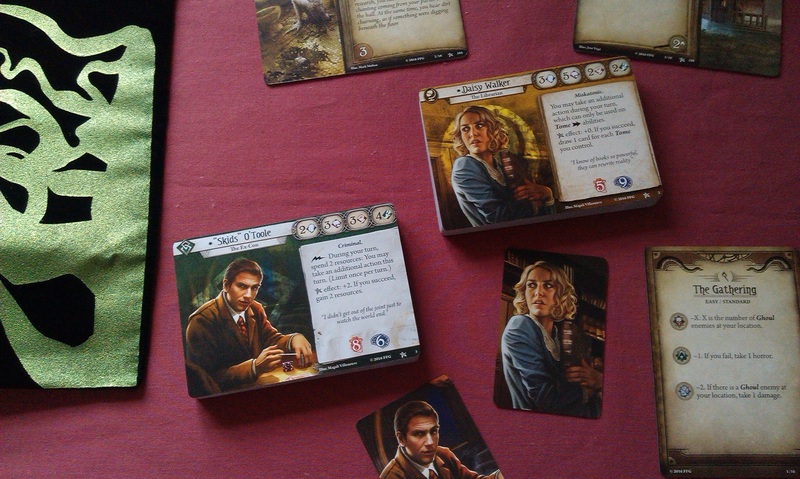 Of course, once I truly get underway, I should have more options from the Dunwich cards as well! Something that I found really interesting, however, was just how much this process actually felt like a real RPG. The ability to level-up your character has, at its core, a sense of where you want that character to go. Do you choose to level-up their combat ability, or their mental attributes instead? In doing so, I feel like I made a conscious decision to refine the Skids deck into something less self-serving than the Rogue cards he starts out with make it feel. His character story tells of how he stole in order to pay for his mother’s operation, yet she died while he was in prison. There’s a noble streak to the character, and so I want to try and make something more of that, if I can, through the deck-building options. 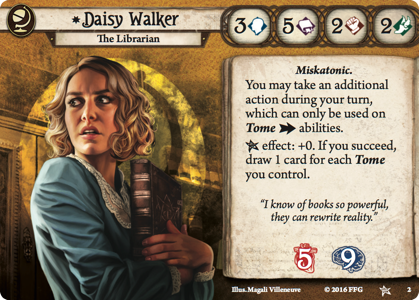 In something of a similar vein, Daisy is all about reading books, but the addition of the Mystic class to her deck allows her to actually gain knowledge from all that reading – in the form of spells. I’m considering making her something of a cleric-style character, therefore, though I need a wider card pool to choose from to do this. At any rate, I thought this was a really interesting aspect of the game, and one that I hadn’t quite expected to come across so well! So the house has burnt down, and Skids has got four experience points and one point of mental trauma for his trouble. Daisy still has five experience points left to use, so hopefully she’ll be able to get more for them after the next scenario! I’m hoping to write these campaign updates on a semi-regular basis, so stay tuned to see how well my daring duo get on! Pingback: Getting back to Arkham! Next Next post: Another new army!